Deb at Mom Mom in Bridgeton's back steps. 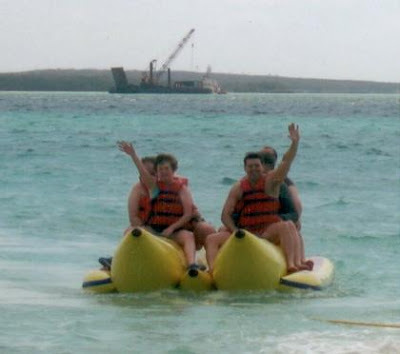 Deb, Bob and Mom on a beach somewhere. 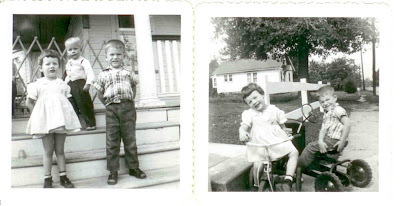 Deb on a tricycle in Mississippi. Dad at training on Fire Island before going to Alaska. Dad at training on Fire Island. Ernie and Olive Thomas - don't know where and then again in the living room of a house my parents rented in Mississippi. Deb is pulling Michele Hood on a sled. This is late in the day because the sun is coming from behind the house and the house faces east. Dee is pretty bundled up and not exactly happy, but she most likely asked to go outside with her brother and sister. Bet you didn't know that camouflage clothing was being sold in those days. The old Pontiac a four door - the pink lady - may have been a 1956 model - Pontiac Chieftain. 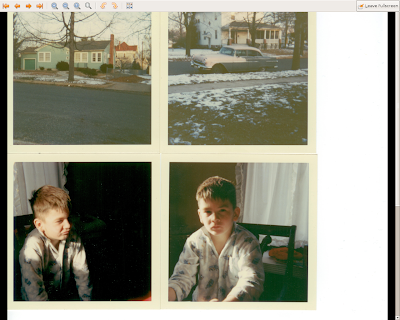 It was the car that we moved from Ambler, PA to Wenonah, NJ with in August 1959. It doesn't snow very often in Wenonah, NJ and when it snows it doesn't last long. Each snow leaves an impression. Lately you can go a whole winter without a good snowstorm. When we were kids in Wenonah snow on a school day would most likely mean a day off. A good friend of mine who grew up in Wenonah and still lives there, Deborah Lake Mix, is a wonderful artist. 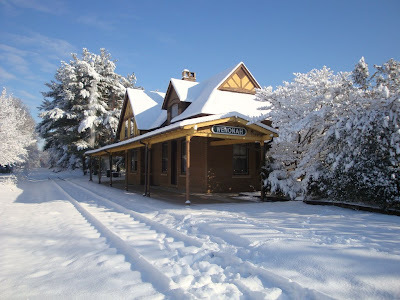 She alertly captured the morning scene of the Wenonah train station after a light snow. You can see from the snow still on the tracks that the number of trains has dropped way down from the height of 168 trains per day. Deb's maternal Grandfather, Samuel Dare Estilow, worked for The Central Railroad Company of New Jersey for a number of years. A crippling accident where his lower leg got crushed in the coupling of two freight cars ended his days as a brakeman. The injuries were severe and the danger of gangrene setting in was great but he wouldn't hear of amputation. He kept the leg but never walked well again. 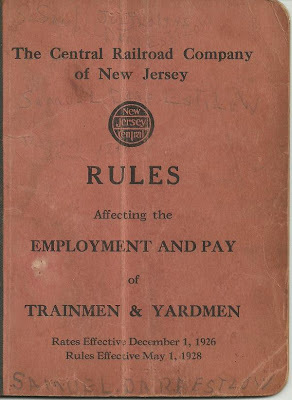 Another name that railroad is the Jersey Central. Here's the cover of his rules book that shows a crease where he used to fold it to carry in his pocket. 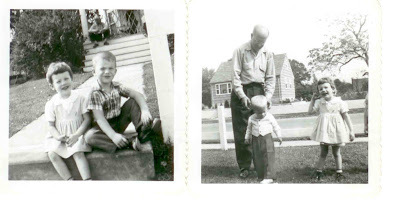 Having suffered such a horrendous accident PopPop was always one to stress safety to his grandchildren. 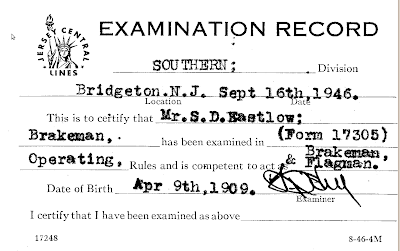 I looked at the exam card below and wondered why it was so neat and unsigned. 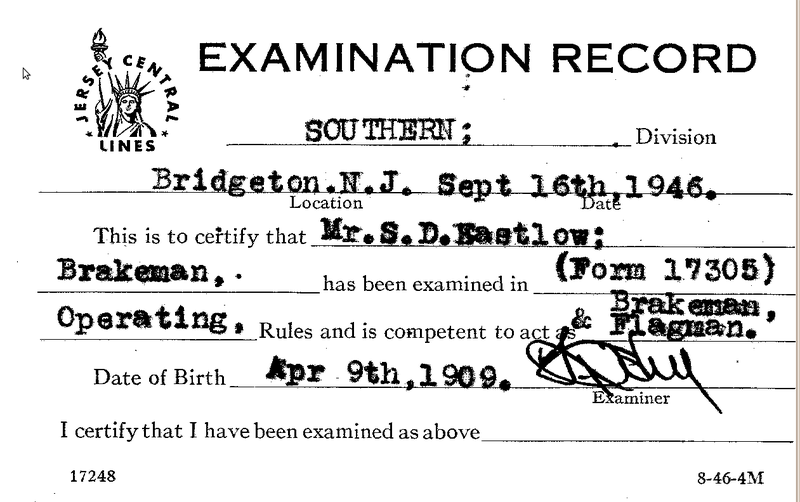 It wasn't until I scanned it that I noticed the typo in the name, spelling "Estilow" as "Eastlow." Most likely they typed out a correctly spelled one which he signed and carried. Perhaps they let him have this rather than throw it away. 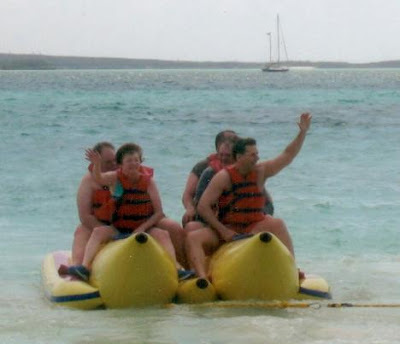 On a cruise in 2005 Deb, Jeff and Pete enjoyed a fast tow on the "banana boat". Becki would have been on there too but she was pregnant with PJ. 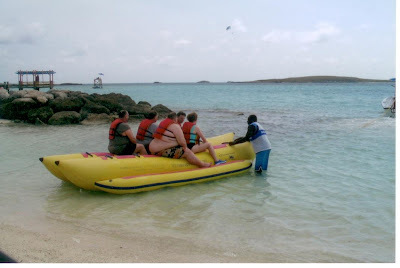 Here they are being told how to signal the tow boat from the banana boat. 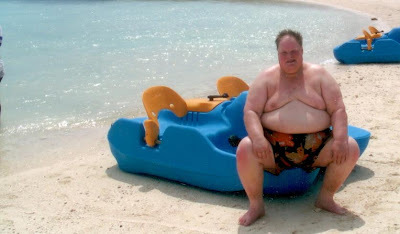 Jeff was not entirely convinced that it was a fun ride. 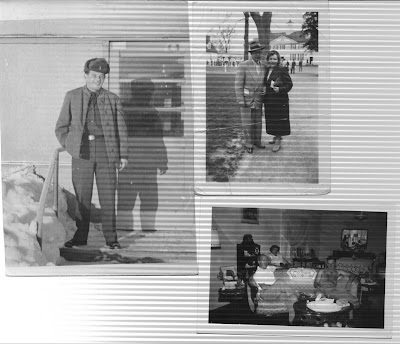 Deb's paternal grandmother was Olive Helen (Parent) Thomas - she loved to laugh and joke around. She looks pretty serious in this photo but she wasn't always anywhere near this serious. 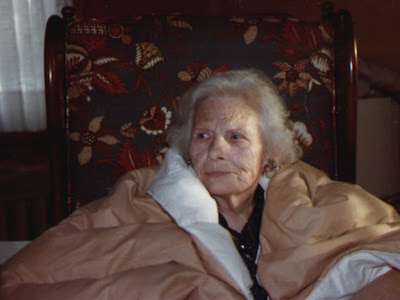 This photo was taken in the livingroom at 102 N. Monroe Ave. She is wrapped up in a comforter and sitting in the "library" chair that was in the corner of the room to the right of the front door. The photo must have been taken late in the day because the sun is coming in through the sun room windows and the French doors (which were usually open) and lighting the right side of her her face. 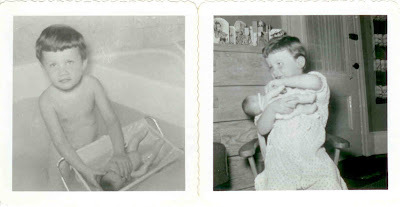 MomMom was a stickler for having things clean. Years ago she made the mistake of buying a red wool rug for her livingroom. 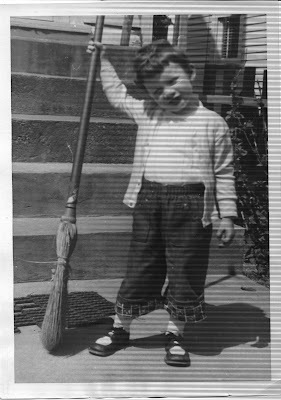 She was always vacuuming and cleaning that rug because both light colored and dark colored soil showed up on it. We hardly ever spent any time in her livingroom for fear of getting it dirty - but you had to pass through the livingroom to get to her sun room with the fireplace. The rug was made too well to wear out and soil never stopped landing on it. If I ever see a livingroom photo from her house that shows the rug I will add it. She was born June 8, 1910 in Millville, NJ and died just after Christmas in 1985. 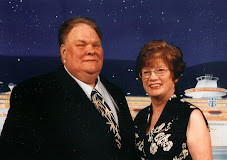 She had been in a nursing home for quite a while before passing away. Her husband Ernie went to visit her every day. 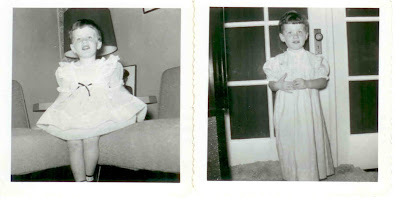 For all the time that I knew her she lived at 50 N. Fernwood Ave in Pitman, NJ. It was big white house with a large side yard. The house was so big that they made an apartment and rented the upstairs out. 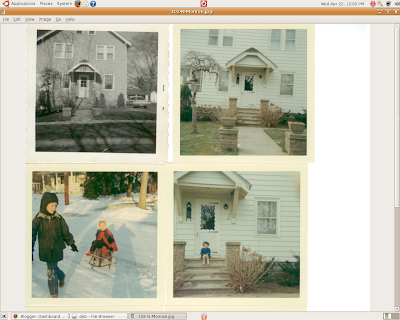 Four photos scanned in together. One enlarged further. 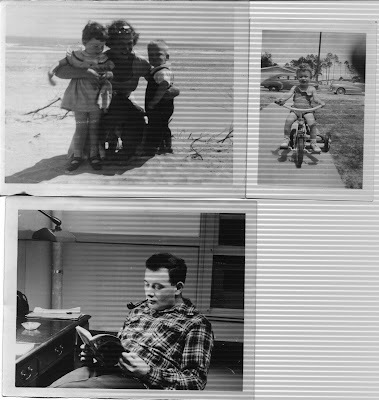 On the top left is a photo most likely taken by Deb's grandmother, Helen Estilow. 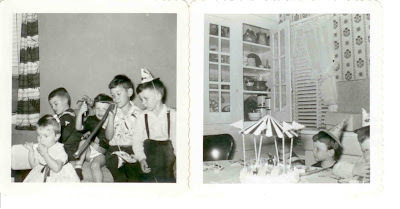 The date on the photo is 1961. It could have been taken in 1960. That car looks like one that Mommom Estilow used to have. 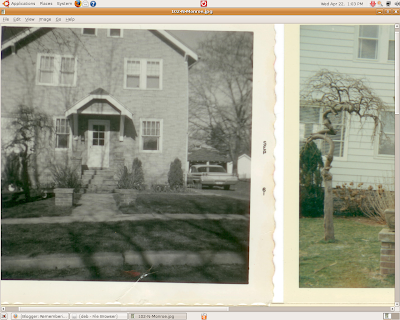 I enlarged the old house photo even more - you can see a wagon and some duck cut outs under the mulberry bush. Mom used to hate the mulberry bush. The berries tasted great but we would walk on them in our bare feet and then track red stain all over. 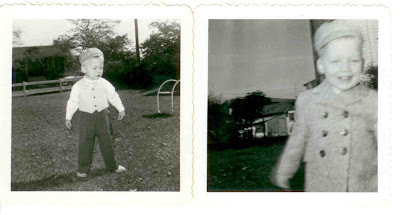 On the top right is the house in 1965 or 1966. 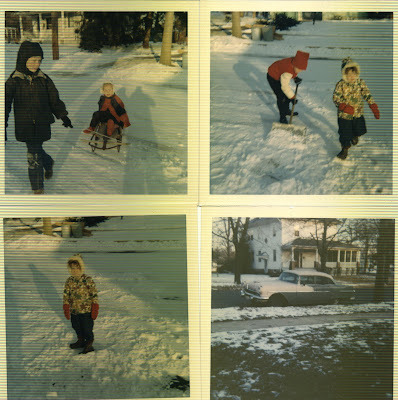 Bottom left Deb is pulling neighbor Michele Hood on a sled. Bottom right Dee is sitting on the steps. Another four photos. Looking across the street at the houses. Notice how few trees were in the backyard behind what was the Wolfe house. That old '56 Pontiac was the one that brought us from Ambler, PA to Wenonah in 1959. We nicknamed it the Pink Lady. Who would ever make a pink and gray car? Who would ever buy one? That's Roger in the morning - about 8 or 9 years old. 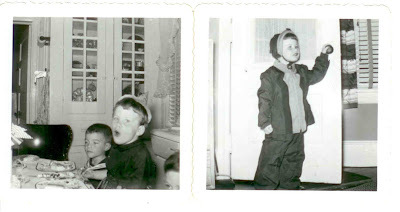 He was not always bright eyed and bushy tailed! 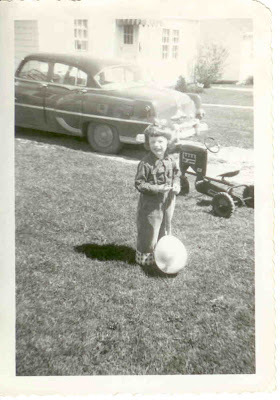 Here's a neat wagon story that I was inspired to write after reading that one of Debbie's classmates, Chris DeHart, was a member of a family that built wagons in South Jersey until motorized trucks came along - at which time they switched to trucks and still build them. 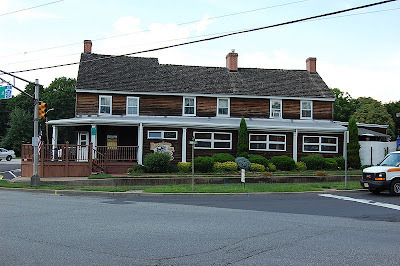 Years ago, about 1978, I told my grandfather, Ernie Thomas, that I went into the Barnsboro Hotel with my father, brother, and perhaps Jeff, my brother-in-law after we had been shooting clay pigeons down that way for a while on a cold afternoon. 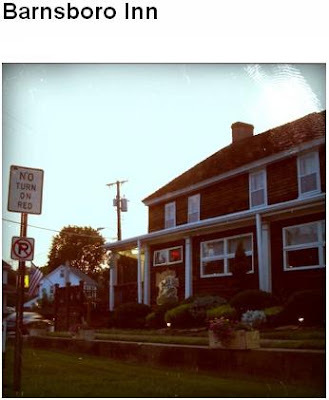 At that time the Barnsboro Hotel was stuck in time. It was very rough and hadn't seen any improvements in ages. The inside was a dingy white with original plaster. My grandfather who was 77 at the time rubbed his chin and said that he hadn't been in there in about 50 years. He wouldn't have gone in then but he was driving down the road out front on a dark night in an old car with poor lights and he clipped the wheel of a wagon. The wheel collapsed. He could have driven on - but perhaps preachers were more convincing in those days - so he stopped. He went inside the hotel and asked the bartender whose wagon it might be. The bartender had no doubt that it belonged to a certain gentleman passed out under one of the tables. My grandfather left his name and address and told the bartender to please give the information to the man on the floor and he would make good on the wheel. About a week or two later the fellow came around to my grandfather and asked for payment. Ernie asked, "How much do I owe you?" The guy came up with a quote that was about twice the value of the whole wagon. Ernie said, "Bring a receipt from the man who did the work and I will pay you." He never saw the guy again. Here's another photo of the Barnsboro Hotel - now called an Inn by the most recent owners. I took this on July 1st, 2009. I added it to en.wikipedia.org because they didn't have a photo of the place. H.A. DeHart workers in Thorofare take a break to pose for a company photo.